Shrimp Cocktail is so easy to make, it’s no wonder this classic appetizers popularity has never waned. Shrimp Cocktail evokes memories of mom and dad and their fancy parties hosted at home. The ladies wore floor length dresses, and big hairdos – so 1960’s. The men drank their scotch and talked of mastering the world. Such fun! Jump forward to present time and a more casual way of entertaining. Thank goodness Shrimp Cocktail has not gone out of style! It’s such an easy appetizer and a great weekend dinner idea. Gather a few good friends, steam a big pot of shrimp and host a peel and eat party on your kitchen table. 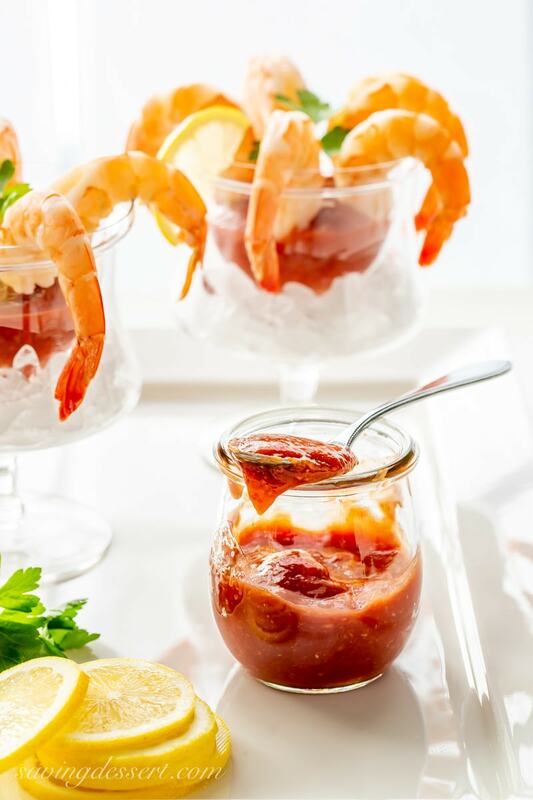 Serve the warm shrimp with lemon wedges, a little Old Bay, cold beer and plenty of cocktail sauce – you’re got yourself a party! You don’t need fancy glasses to serve shrimp cocktail. 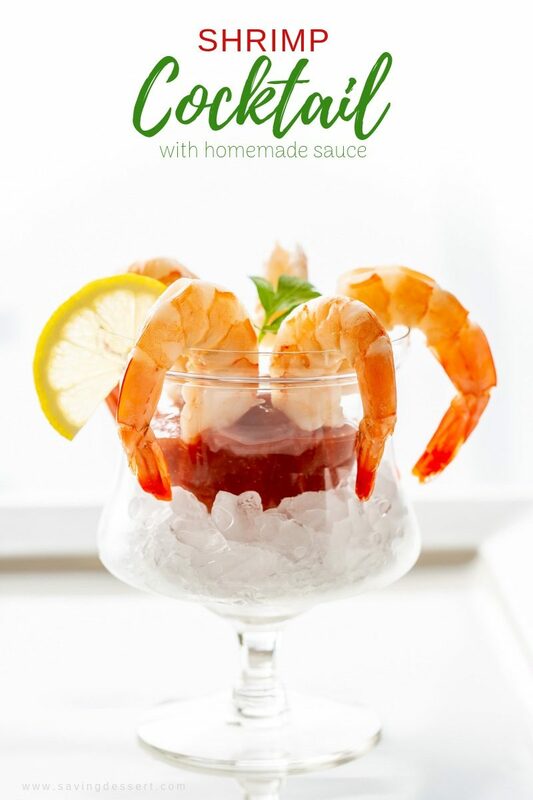 Shrimp Cocktail sauce is so good, and this homemade version nails it! Our easy Cocktail Sauce is thick and rich with plenty of zing from the horseradish. Check the seasonings and adjust to your own tastes. Maybe you prefer more horseradish, or less. It’s all good! This easy appetizer can be made up to 24 hours in advance and refrigerated until needed. Talk about easy entertaining! Get your retro-on and try this blast from the past. No need for fancy dresses to enjoy Shrimp Cocktail! Steam your shrimp! Don’t boil! I use this steamer saucepan all the time at home. Made by Farberware, this Classic Stainless Steel 3-Quart Covered Stack ‘n’ Steam Saucepot and Steamer is great for cooking all your favorite foods. Click on the photo for more information. Try this classic, easy, make ahead appetizer for your next dinner party. Recipe is easily doubled or tripled as needed. It’s personal preference but I like to remove the dark vein, or intestinal track from larger shrimp. With kitchen shears cut through the meat and top shell along the back of the shrimp to expose the vein. Use a toothpick to pull the vein up, then remove and discard. Watch the video linked in the NOTES for a how-to technique. Leave the shells and tail on. If you don’t have a steamer pan, use a large mesh strainer set over a pot with a lid. Set a large bowl in the sink filled with cold water and ice. The cooked shrimp will be added to the ice water bath to stop the cooking process and quickly chill the cooked shrimp. Bring a pot of water to a boil. Place half the shrimp in the steamer basket or strainer. Sprinkle shrimp with 1 teaspoon Old Bay seasoning and toss to coat. Place the shrimp over the boiling water, put the lid on the pot and steam the shrimp for 3 - 4 minutes. Toss the shrimp halfway through to move them around. The shrimp are done when slightly curled, pink and firm. Don’t overcook or you will have rubbery shrimp. Add the cooked shrimp to the ice water bath. Repeat by tossing the remaining uncooked shrimp with Old Bay and steaming until firm and pink. Add the shrimp to the ice water and allow to cool. Peel the shrimp, leaving the tails intact. Drain well, pat dry with paper towels and refrigerate until ready to serve. Combine the ketchup, horseradish, Worcestershire sauce, Old Bay seasoning and lemon juice. Stir well, cover and refrigerate until ready to serve. To serve on appetizer plates, line the plate with a small lettuce leaf. Arrange 5 shrimp over the lettuce. Add a small cup of Cocktail sauce for dipping and lemon wedges for drizzling. Click HERE to watch a VIDEO by The Spruce for an easy tutorial on how to devein shrimp. Cooked shrimp will keep well for several days if properly refrigerated. This looks so elegant and delicious Tricia, I have to make it. Yes! Party leftovers were the best Liz – thanks! There is nothing that is as classy as shrimp 🍤 cocktail. Even when it’s served on newspaper like we used to have in Texas. You can never have too many shrimps! I can eat the shrimp right out of the pan myself! Love this stuff 🙂 Thanks Abbe. Those were the days and I remember those long skirts! Cocktail shrimp is still served fairly often within our group of friends but definitely not served as beautifully as yours in individual glasses. Here, it’s just shrimp on a platter with the cocktail sauce in the middle and “help yourself”. When we’re on vacation, it’s Costco’s tray of cocktail shrimp 🙂 You’ve definitely brought back some lovely memories, Tricia! Thank you Susan – we come from the era I do believe! Costco shrimp is great for vacations – absolutely! But if you come across some fresh shrimp – give this a try – bet you’ll love it! 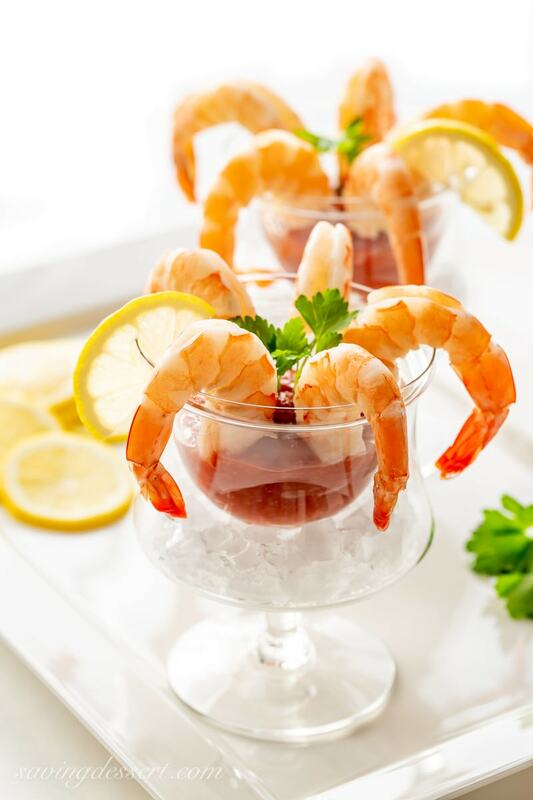 It is hard to beat a good shrimp cocktail and I’m intrigued by your cooking method as I have always boiled then – I give steaming a try. Your pics are very good as always. I really enjoy shrimp steamed Larry – hope you do too! Thank you. Thank you so much Sue! Sorry about the allergy – my mom developed it in her adult years too. I love those dishes! they might be for caviar, but they’re perfect for a shrimp cocktail. So glad you made your own sauce! Pretty photos. Thanks Mimi – you are a sweetie! Such an elegant and yet decently healthy appetizer. Love everything about this including your stunning photos! 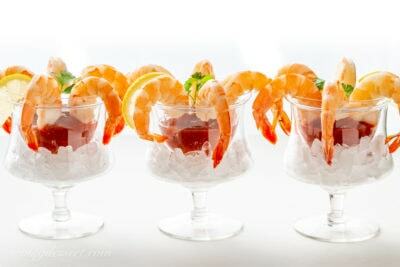 What beautiful and delicious shrimp cocktails! Thanks Angie – so good, clean and fresh. And shrimp are low fat too!